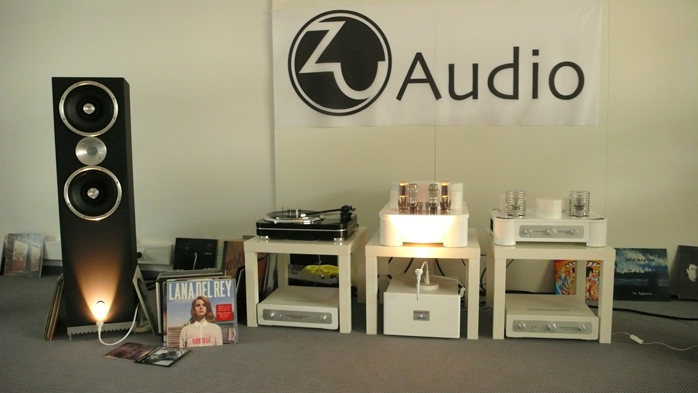 At the show the SAGA amplifiers combined with a dCS Puccini source and a pair of Crystal Cable Model Three loudspeakers. Cables of course were from the Absolute Dream range. The first thing evident was huge dynamic range (claimed to be 138dB). This translated into a very close to live experience. Each transient was a little shock wave without the apparent rise time delay most hifi systems suffer. Next the sense of loudness was completely different than with any other system mostly due to the extreme speed and ultimate control over the transducers. Even at lower volumes the surface of the delicious Nespresso we'd been offered showed ripples. The chairs we sat in got excited too. Siltech will definitely change the high-end landscape with this SAGA concept and listening habits will be part of it. By this we mean that the overall experience of listening to music with this system is so intense and captivating that sessions will probably be reduced from many mindless hours in a row to live-concert lengths up to maximally three hours. We were literally pushed into the obviously Swiss room of Swissonor by Edgar Morineau of Parisian audio dealership Connemara whom we’ve met often before to share the good things of life with. Here Jürg Schopper and Urs Frei showed and demonstrated their B.A.C.H. 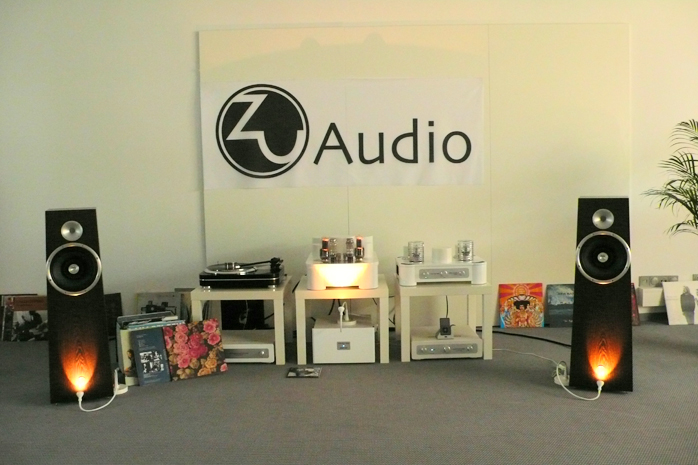 12 speakers with Swissonor valve gear and a Thorens turntable. 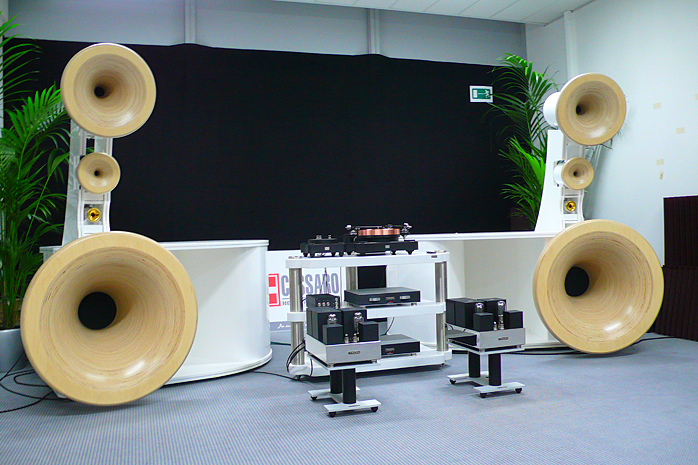 These unconventionally looking and set-up speakers were of the 2-way coaxial variety but sport a Tractrix horn. Compared to the Siltech/Crystal experience this one was very different and soothing – an altogether opposite way of enjoying the music. 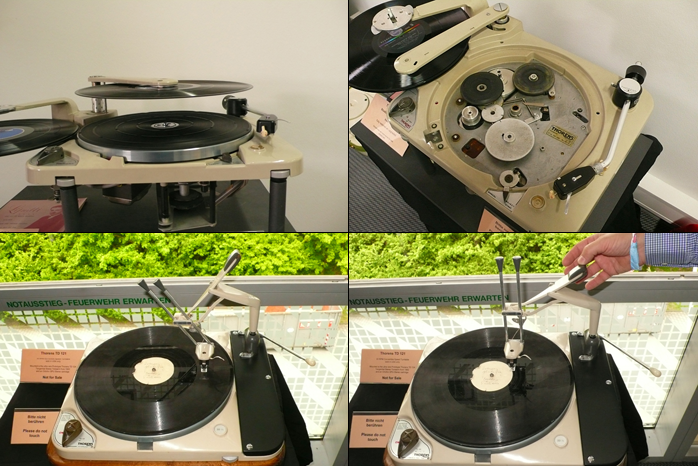 After some listening we took a walk around the room and Jürg Schopper led us around whilst proudly showing off the features of rare Thorens turntables he has restored or simply rescued. 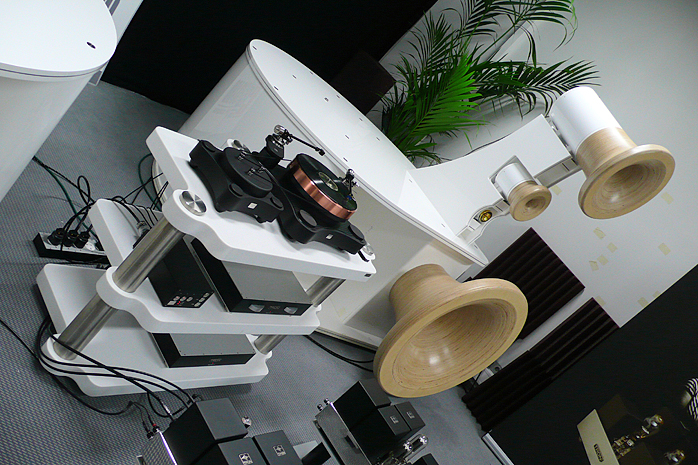 Of this unique tangential tone arm there were originally only 1000 units made. For reasons unknown to anyone alive apparently Thorens themselves destroyed 998 so only two remain. And here was one of these ultra-rare extremely well-balanced arms on fully working display. Another rare and amazing Thorens construction was an automatic record changer. Based on a TD124, a real watchmaker’s clockwork exploits the idler wheel to drive the mechanism. Watching 45 and 33 records change place with the tone arm moving about was mesmerizing. The sheer speed and precision were fabulous. Jürg admitted that sometimes when he has friends over he switches on the changer purely for visual entertainment. We thanked Edgar for introducing us to Swissonor and their proprietors. Tron, Cessaro and TW-Acustic teamed up and how. In a weight-no-object setting there was the TW-Acustic 3-motor Raven Black Night turntable, the Tron Syren II preamp and Discovery 8wpc 300B SET power amplifier feeding the latest Cessaro Beethoven hornspeakers. For Graham Tricker, Thomas Woschnik and Ralph Krebs of the three collaborating companies, setting up for the show clearly was no lightweight task. But the 2 x 1-ton Beethoven must have taken the cake and broken their collective backs. The bass horn is not merely heavy, its 1.60m depth alone doesn’t make it the easiest thing to handle. Once set up, tuned and approved however, the sound was in stark contrast to appearances. While looks were overwhelming, the sound was nice and subtle. Listening with our eyes closed was thus quite different than eyes open at first. Once the visual spectacle subsided and only the sound remained, one could enjoy a very special and refined system here. Last but not least in our overview is the Zu/Trafomatic room. Zu’s Sean Casey came all the way over from Ogden/Utah to team up with Sasa Cokic and Mica Despotovic of Trafomatic Audio. Initially their setup was sideways but a better click with the room was achieved with the long wall. Then the big Zu Definition MKIV found itself swapped out for the smaller Soul Superfly. A Monarch turntable played a Zu-modified Denon DL-103 cartridge. 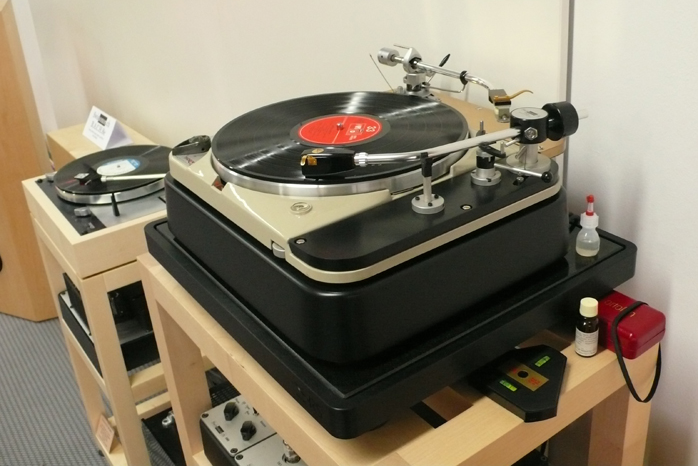 Its output fed the new Trafomatic Reference phono stage and either an Experience Two integrated directly or first routed through the Reference preamplifier. All new Trafomatic equipment like the 845 Fusion amp with interchangeable 45/2A3 drivers and 101D preamp appeared clad in the firm's now signature white lacquer. When Sean was around, music was no standard audiophile fare. Even though the room was initially not to the exhibitors’ liking, when the setup got eventually turned about everything fell into place. Then it became about playing plain old records like in the olden days. ‘You know this one? Now listen to this’. It was that type of atmosphere. This room with its very simple display furniture proved that it's not necessary to put things on the floor when a simple table will do. We are fully cognizant how much we missed. Mentioning the following in passing still doesn’t make up. But covering all 366 exhibitors would have turned into a show catalogue which wasn’t our idea of a good time. As was standard over the last few years Silbatone once again rolled out a giant Western Electric theater system with many compression horns. The room shared with Suzuki-san of GIP Laboratories was filled to capacity every day and demonstrations of the 85-year old system were entertaining. Less so was our experience in the very dark Voxativ room where we had to flee when some really nice live Rock from open-reel tape was brutally stopped and changed over for a Whitney Houston CD. 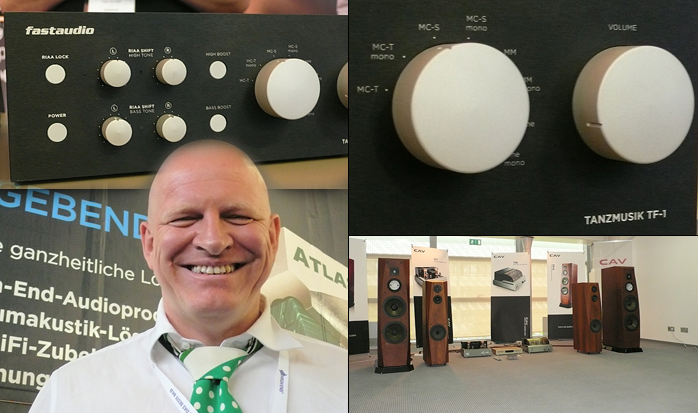 We must also mention Thomas Fast who very proudly showed off his new Tanzmusik phono stage with separate power supply. Thomas loves old records with dance music but they’d never really sounded up to date. For that reason he designed a phono stage that not only has fully adjustable RIAA correction but also presets for bass and treble boost. To close out we present the cue sheet of the music we brought for this year’s event. 12 - Minnesota Orch - Danse Macabre.wav.